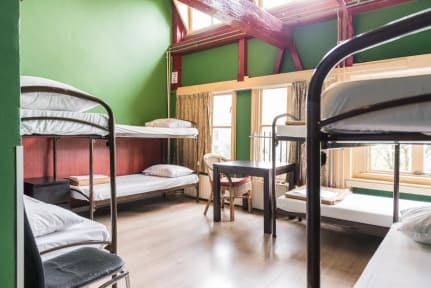 Hostel the Globe Center i Amsterdam, Nederland: Bestill nå! Group Reservations have to be cancelled at least 1 weeks in advance otherwise we are forced to charge the cost of one night stay on your credit card. 2nights minimum stay for all groups during the year. Hostel The Globe Center is located close to the Red Light District and overlooks two of the most famous historic canals in de Wallen, the oldest part of Amsterdam city. 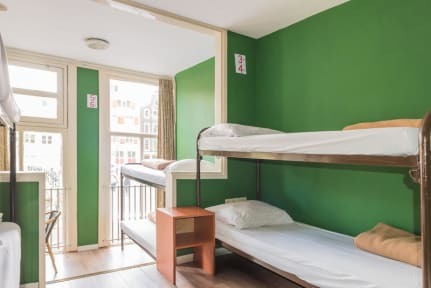 Its only three minutes walk from Centraal Station and less than 10 minutes walk from all of the major tourist attraction points, such as Dam Square, Flower Market, Shopping Streets, Rembrandt Square, the Red Light District and various coffee shops in the Centrum area. However, the Globe enjoys its quiet and easy neighbourhood while it is situated some distance away from the major tourist traffic. The hotel has 20 clean and pleasant private rooms, each with its own en-suite bathroom and shower room. It has triple, quadruple, and up to eight-bed group en-suites available. Besides this, we have the largest collection of shared dorms here in Amsterdam. We have dorms suitable for from four persons up to 10persons! Linens are included on all beds, but free towels (with limited numbers) are distributed upon request at reception. We also have free wireless connection available in the lobby area. The Globe is also best known for its sports bar, which is the biggest in the Red Light District and is open up to 3 o'clock in the morning (or 5am in the weekend). You can view all major sport events (like the Premier League, European League, Super Bowl, N.F.L., N.B.A., etc.) across nine TVs and two big screens. There are also two pool tables and one darts board for any exciting moments. In the bar, not only English or American breakfast is served, but also delicious lunch or dinner for you to order. Hostel guests get a 20% discount on the food menu upon presentation of the hostel entre card. Also, there are Happy Hours running Sunday to Thursday in the bar - you and your friends can enjoy our offer of buying one Heineken draft and getting another one free during these happy hours! Amsterdam is such a great place to have fun. So, on behalf of our friendly staff, we hope to welcome you to our hotel. Well do our best to make your stay a unique and pleasant one! Please note that we do not permit guests under 16 years of age in the shared dorms. Everything was dirty, and the staff was more hostile then friendly. We didn't expect much because of the price, but to have a place cleaned, is always expected!